ADDIS ABABA , Jul 2 2013 (IPS) - Sub-Saharan Africa may be home to six of the world’s 10-fastest growing economies, but it also has a majority of the countries that are suffering from a food crisis. In fact, of the 20 countries in the world suffering from prolonged food shortages, 17 are in Africa, according to José Graziano da Silva, Director-General of the Food and Agriculture Organization of the United Nations (FAO). The commitment to making agricultural development and the eradication of hunger the focus of Africa’s growing economy reached a new consensus when African and international leaders and key stakeholders met at the African Union headquarters in Addis Ababa from Jun. 30 to Jul. 1. At the summit, leaders agreed to renew their partnership and commitment to “Zero Hunger” in Africa by 2025. 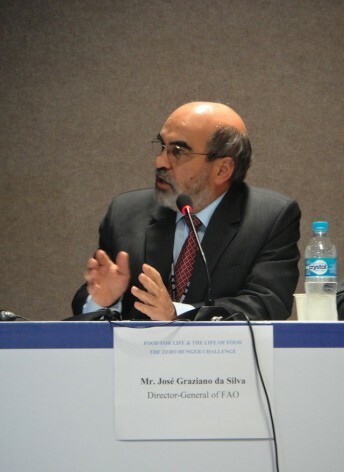 Da Silva helped launch and implement the Fome Zero (Zero Hunger) programme in his native Brazil, which prioritised investment in poor farmers through social protection nets, and lifted 28 million Brazilians out of poverty. In this interview with IPS, Da Silva says that he is confidant that the Millennium Development Goal (MDG) of halving the number of hungry people in African countries by 2015 can be reached and that the goal is not too ambitious. The eight MDGs, adopted by all U.N. member states in 2000, aim to curb poverty, disease and gender inequality. He believes that Africa is entering a new era with greater investment in agriculture, and that stronger coordination between governments, civil society organisations and the private sector would make the goal of zero hunger in Africa realistic by 2025. Excerpts of the interview follow. Q: Is the goal of eradicating hunger in Africa by 2025 really achievable? And how does this campaign plan to achieve this target? A: We have proven that it was possible to achieve the first MDG to halve hunger by 2015. Eleven countries already have achieved this in advance of the deadline…and several other countries are on track to achieve this goal in Africa. We believe that if the leaders of Africa get together with civil society and the private sector to achieve the same goal of eradicating hunger – we can do it by 2025. Why am I optimistic about that goal? Because, firstly, Africa is on a very special momentum, it is the region in the world with the second-highest level of economic growth; it also has the resources available. Furthermore, agricultural development is only just starting to take priority in Africa. We have on the continent millions of family farmers working at subsistence level. If we can convince them to increase their production and to adopt new technologies that are already available, then this will be more than enough to eradicate hunger in the region. Q: Only 11 out of 38 African countries have already achieved the MDG of halving hunger by 2015. With only two years left to realise this goal, has this target been unrealistic? And why do you think the Zero Hunger goal is any less ambitious? A: We must remember that when we start to walk, the first kilometres are always very difficult. It requires some time to get accustomed and grow familiar with the different factors involved in this transition and also to understand what is available as support. We have everything in place – we are working to coordinate the governments, CSOs and the private sector so that they can work together in solidarity. I think we still have time to achieve the MDG of halving hunger in Africa by 2015. We have 920 days from now, that is not a short period of time. Hungry people don’t have a lot of time either – they cannot afford to wait. What is important is that African governments have the message – they know what the objective is and they know how to meet this objective. We are not sending a man to the moon. It is not complicated. Simple steps like scaling up practices that are already implemented in many African countries will go very far. Q: Are you confident that there is the political and social will from African governments to eradicate hunger? A: That is exactly what this summit is about. This is a landmark occasion for African leaders to demonstrate without delay to their neighbours that there is the will to eliminate hunger, it is on the way and now more than ever before is the time to work together. Q: Some of the highest economic growth rates in the world are being experienced by African countries. And yet one in four Africans still suffer from chronic hunger. Is economic growth alone enough to end hunger? A: This is the most important lesson being learnt by this summit. Growth and increasing food production are not enough. In Africa we need to look particularly at access to food. Many undernourished farmers suffer from not having access to land, while others cannot buy the food they need because it is not cheap enough for farmers to buy according to their salary, while many of them are jobless and without income. The challenge is to approach all these things at the same time. But we can do it. This has already been demonstrated and achieved by the countries that have already halved hunger rates by 2015. Q: Global food prices continue to be volatile. How is this impacting the effort to reduce hunger in Africa? A: This is one of our greatest challenges. We can boost resilience of food producers using what FAO already has in place. FAO has implemented a monitoring system and this has helped us a lot. But we need to move beyond that. This October, FAO will have a second meeting with the G20 Ministers of Agriculture in Rome. We hope to address important factors like regional emergency stocks and how to improve our statistics. Moreover, we will look at how to improve inter-governmental cooperation when dealing with emergency situations such as the famine in Somalia two years ago. If we could improve this effort to bring more global governance to the food security issue it will help a lot. This is not a problem for the African countries – this is a problem that needs to be solved globally. The G8 and the G20 countries need to especially help those countries that are not part of these two groups and are suffering, as they have the responsibility to generate effective global governance.